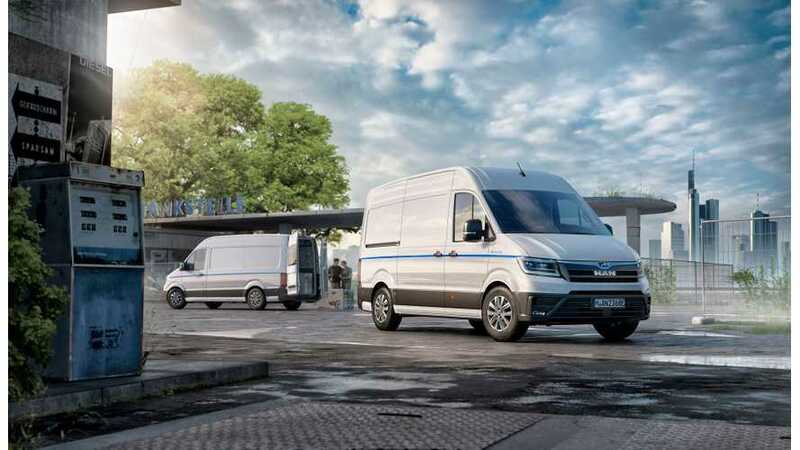 MAN Truck & Bus (part of the Volkswagen Group) announced MAN eTGE electric vans that will hit the market in July starting from €69,500 ($86,200). 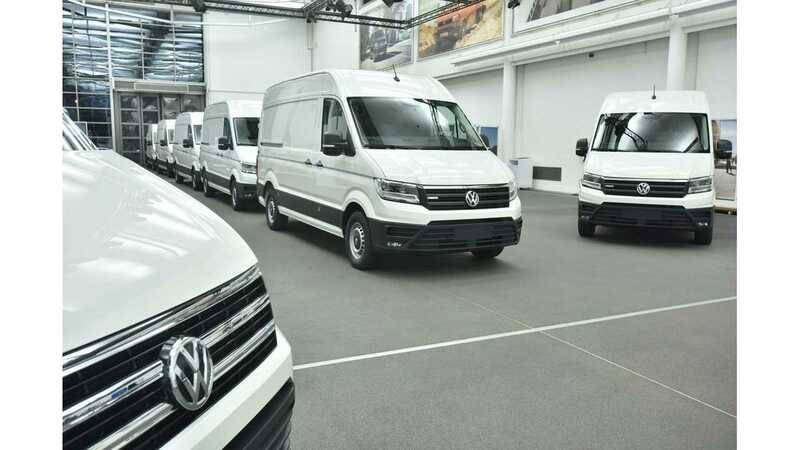 The specification of the eTGE is close to the same as the Volkswagen e-Crafter, which will be available soon. With a 36 kWh battery and 160 km (100 miles) of range, it doesn't seem a solid value proposition but MAN says that 70% of urban deliveries are below 100 km (62 miles) a day. At first, sales will begin in Germany, Austria, Belgium, France, Norway and the Netherlands. MAN is now selling a fully electric van, another step forwards in the direction of zero-emission metropolitan areas. The MAN eTGE will meet the demand for future distribution and freight transport in urban areas with its electric motor. Providing a range of up to 160 kilometres and a payload of 950 to 1,700 kilo-grams, the electric MAN TGE is ideally equipped for these tasks, depending on the type approval (3.5 or 4.25 tonnes). For around ten years, MAN Truck & Bus has been working on inno-vative concepts for supplying and removing material in the urban environment. Cities increasingly find themselves faced with the challenge of reconciling a healthy climate and their inhabitants’ quality-of-life demands with the transport of goods and deliveries in central urban areas. This problem involves developing ideas for re-ducing traffic at specific times and relocating it out of the city alto-gether, new approaches to the use of land, plus new transport and drive concepts. In view of this situation, MAN Truck & Bus has put forward a wide variety of ideas and studies from the truck and bus sectors in recent years. Advancing these ideas consistently, the sales of MAN’s first fully electric-powered production vehicle are now underway with the eTGE. Around 70 percent of light commercial vehicles used in urban areas travel fewer than 100 kilometres per day on average. The average speed reached during this is low. With this in mind, the vehicle’s theoretical range of up to 160 kilometres covers about three-quarters of all urban-core transport. Sooner or later, as with mobile phones, it will be completely normal to plug a fully electric vehicle in to charge for the coming day – usually overnight. Charging times vary. A 40 kW charging station fills a battery up to 80 percent in 45 minutes. The MAN eTGE can be restored to full opera-tional capacity after just under five and a half hours on an alternat-ing current wallbox. Approximately nine hours are needed for a full charge with 220V AC. With the relevant battery maintenance, the 36 kWh rechargeable battery only loses around 15 percent of its ca-pacity after ten years and around 2,000 charging cycles. Especially since individual modules of six or twelve cells can be replaced sepa-rately. The modules are located under the slightly higher load floor, as used for rear-wheel drive body versions with diesel engines. The choice made for the electric front-wheel drive TGE was a per-manently excited synchronous motor with 100 kW maximum availa-ble power. It has 290 Nm of torque at its immediate disposal, which can also be used over the entire speed range, ensuring highly agile handling. Combined with the maximum speed of 90 km/h, this re-sults in fuel consumption of around 20 kWh per 100 kilometres. In addition to the carrying capacity, the assistance systems have al-so remained unaffected by the electric technology. The eTGE comes with a comprehensive range of built-in standard equipment, includ-ing a navigation system, heated windscreen and other features that help to make driving easier and safer. Naturally, as with all TGEs, the emergency brake assist (EBA) continues to be installed as standard. In the initial phase of the roll-out, the MAN eTGE can be ordered with the standard wheelbase and high roof. The product line is pri-marily aimed at fleet customers with a tailored service concept to tend to their needs. Initial customer enquiries and signed sales con-tracts have already been made for the MAN eTGE, which costs around €69,500. The first electric-powered vans from MAN are to be used for the first time in metropolitan areas of Germany, Austria, Belgium, France, Norway and the Netherlands.